Over the past week I attened the biannual planetary and exoplanetary climates conference Exoclimes. This year it was held in Davos in the east of Switzerland. 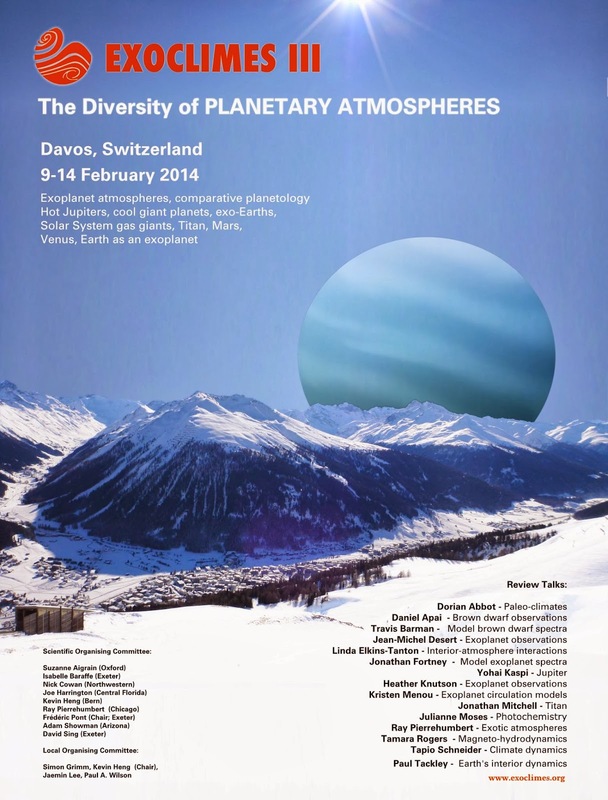 The conference itself brings together experts in the field of planetary atmospheres from our own system and beyond, to exoplanets and brown dwarfs. It also importantly brings together both theorists and observers in an effot to share knowledge, promote understanding, and grow collaborations. "Things I learnt fro Exoclimes III" with you now. Paleoclimatology is a fascinating subject for instance did you know that the spikiness of a leafs edge can tell you what latitude of the earth you are at due to a temperature correlation. If you spend all of your money on a massive conference room then you cut back on the amount spent on coffee, which is not the greatest idea when dealine with over 150 astrophysicists. The exoclimes drinking game this year required you to take a drink each time someone mentioned 'clouds' or 'WFC3'. Let's just say that if we were actually doing this Tuesdays talks would have been liver destroying. The amount of notes that you take during each talk seriously diminishes as the week goes on. Unless you know they are specific to you or broad enough so that you know what they are talking about (generally rare but appreciated). Venus is the biggest problem we have in planetary science. She is also the queen of super-rotation. From the observers: It is important to constrain the C-O ratio. Hot Jupiters with high albedos probably have high reflective clouds. The smaller the star the smaller the planet we can observe. You need as much data as possible; transit+eclipse+RV+phase curve. WE NEED MORE TELESCOPE TIME! We need models complex enough to fit the data but not so much as to introduce degeneracies. 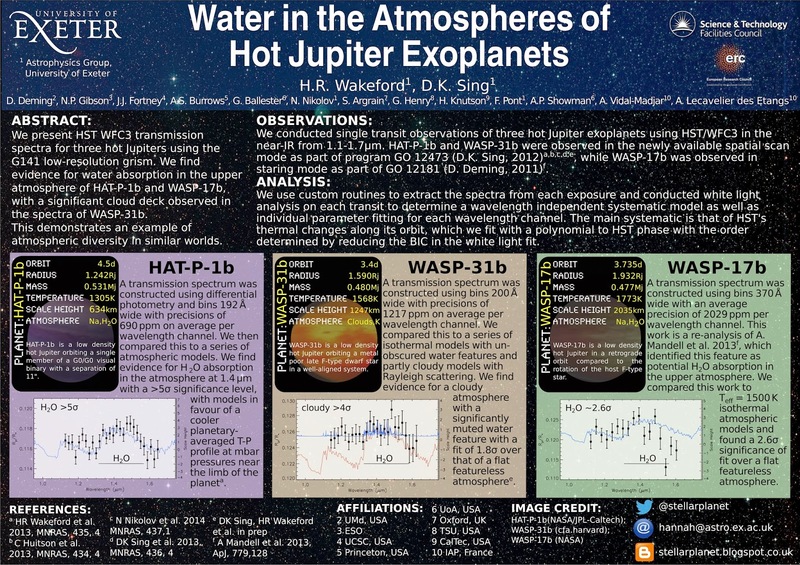 Many enshrouded exoplanetary systems, like WASP-12, may have disintegrating close-in rocky planets leaving a metallic diffuse haze surrounding the inner system. Both Juno (2016) and JUICE (2030) are going to tell us a lot about the atmosphere of Jupiter. There are knowns, known unknowns, and unknown unknowns. If we want to detect the transmission spectrum of an Earth analogue transiting a sun-like star within 40 light years it would take 77 years and a very good telescope. There are many and varied atmospheric retrieval techniques and all of those involved will happily sit on stage and argue about them with an audience desperately wishing they would stop eating into the one and only coffee break they get in the day. There are still a huge number of questions to both ask and answer - but hey, that's not a bad thing or we would all be out of a job. And finally if you want to wake everybody up at the end of a very long week make sure that the last talk is by Charbonneau. I mean we all still desperately needed a drink at the end, but it helped. Overall it was a really great week and I can honestly say I learnt a lot more than just the highlights I have shared above. As my first international conference it was also a fantastic opportunity to meet some collaborators and hopefully make a few more and I am looking forward to being able to go to Exoclimes IV in 2016 (if I can get a post-doc). Also check out the website for links to most of the talks and the posters http://www.exoclimes.org.